Updated: Samsung wasted no time in rolling out a laptop to back up its YouTube trailer, announcing the introduction of an updated Series 7 Chronos alongside the first Ultra in the Series 7 tribe. The Chronos comes complete with RAMaccelerator tech that boasts 150 percent increases in browsing speed and app-run time. A Full HD (1920 x 1080) 15.6-inch display and aluminum body coat the outside, while the innards include quad-core i7 processor by Intel that offers up to 16GB of memory. Storage of up to 1TB, AMD's 2GB Radeon HD 8870M graphics card, two USB 3.0 ports, double USB 2.0 ports and HDMI round out the Chronos crumbs. As for the Ultra, it too packs a Full HD screen but comes with the option of either a Core i5 or Core i7 processor. Three USB 3.0 ports plus 4G LTE connectivity capabilities mean the Ultra can stay ultra-connected. We'll get a chance to see these 'tops live when Samsung shows the new Series 7s off at CES next week. What do you get when you cross a robo-panther with a mecha-eagle? 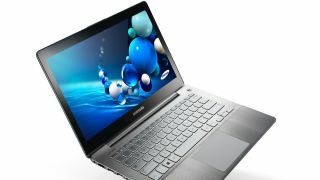 Apparently, Samsung's new Series 7 Chronos laptop. The punchline comes to us from a video Samsung published today on YouTube. The teaser video keeps the exact upgrades to Series 7 pretty mysterious, but it does drop a few details. The biggest news is Chronos will come with a new AMD Radeon HD 8870M graphics chip. The video also promises 50 percent faster app loading thanks to RAMaccelerator. Also added is a "true to life" full HD 1,920 x 1,080 display and JBL speakers. It's not exactly clear where those upgrades will land. Samsung's video doesn't specify if it's launching new notebooks or just revamping the existing Series 7 line. Just last year, Samsung added a 17-inch notebook to Series 7. The new book on the block already has JBL speakers and a Full HD screen with the same resolution promised by the video. Samsung may put a new graphics chip into the 17-inch version, or it could bring the 14- and 15-inch models more up to speed. The Korean company could even release a completely new notebook with all the promised features - the YouTube offering just isn't too specific. TechRadar's requested more info from Samsung and will update this story if and when the company sheds some light on its plans. We'll also be on the look out for details at CES 2013 next week.